Just by the pull the cover had on me, I knew I wanted to read, “My Author is Dead” by Michel Bruneau. Yet I read the back to make sure and I knew this was going to be a different type of read. The story takes the reader to a dystopian society where writing style philosophies are labels for theologies and political tones, all of which were the basis of its social structure. The story begins inside a courtroom within small village where nothing ever happened. Adam had taken the wrong side, something you do not do under any circumstances in this type of community, not even if you are a seven-year-old Authorian boy innocently mesmerized by a beautiful Kafkaist young girl. Their encounter would have been no big deal if it weren’t for Cassandra seeing them in the forest and telling on them to her perfectionist parents. This event would forever change Adam’s life. Bruneau is a genius of undertones, and you can tell he really enjoyed playing with this talent in “My Author is Dead.” Because of all the fun he must have had creating the plot, we readers now have one of the smartest and clever reads of 2016. His writing style is vivid. His characters are so genuine I forgot at times that they were characters in a book. The story was so captivating it took me away into its plot and wouldn’t let me go, not even in the rare moments I managed to put the book down. This is a book that readers should make time to read to savor its clever cynical tone. I didn’t the first time I read it and couldn’t imagine not wanting to read it again, so I did, but took my time to enjoy the ride. Although it can be an easy read, I truly enjoyed it even more the second time around when I read it over the weekend with no rush or constant interruptions. 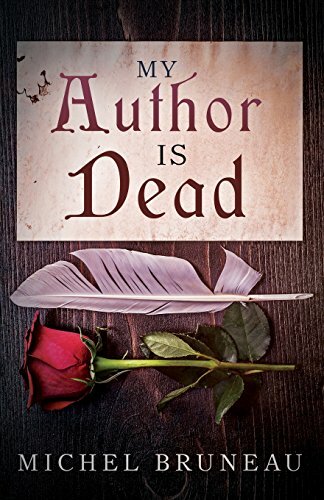 Overall, “My Author is Dead” by Michel Bruneau is a very well written, five-star, unique, clever, fun, and memorable read. Not your average book!